HÀ NỘI — Vietnamese oncologists say there is no proof that the Cuba-made Vidatox, also known as blue scorpion venom, is effective in fighting cancer, as advertisements claim. 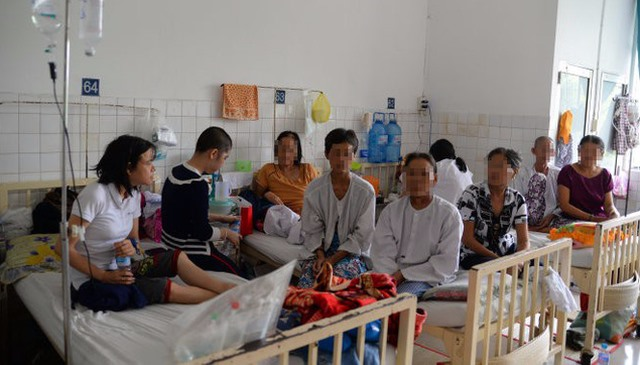 Trần Văn Thuấn, director of the National Cancer Hospital (K Hospital), told the Tuổi trẻ (Youth) Newspaper that there were two types of Vidatox in the market – medicine and supplement. The medicine, at present, is being clinically studied and cannot be circulated. Other doctors and researchers have also issued warnings about this alternative medication. In June, Trần Bình Giang, director of the Việt Đức Hospital, shared on social media the opinion of doctors at the Clinico Quirugico Hermanos Ameijeiras, Cuba’s most prestigious cancer hospital. “Many leading professors in Cuba told me that they did not use Vidatox in cancer treatment. Blue scorpion venom is a traditional method which has not been clinically proven,” Giang wrote. His post has received a lot of attention from medical experts. Lương Quốc Chính from emergency department A9 at the Bạch Mai Hospital in Hà Nội, who is also known as a moderator of a resident physicians’ forum, cited a new publication in the Nature magazine as evidence against the usage of blue scorpions venom in cancer treatment. According to the paper, this product does not have any effect in decreasing the size of liver tumours in humans; it could even increase the invasion of cancer cells. Despite the warnings, however, Vidatox remains popular. Pharmacies around K Hospital offer this product, commercially named as Vidatox 30 CH, for VNĐ2.2 million (US$100) per 30ml bottle. On Facebook, it is sold at VNĐ2.7 to 3.5 million ($120 to 154) per bottle and heavily advertised as an effective cure for cancer. The Tuổi Trẻ report also said that there are fake Vidatox products being sold in the market, and dubious instructions given to patients. While the owner of a pharmacy near the K Hospital said that the product could be used within ten years of the manufacturing date, it was stated in the same product’s instruction that the blue scorpion venom was only effective if used within 30 months. Last month, Hà Nội Police inspected a huge stock of Vidatox without any certificate of origin. Investigators concluded that Nguyễn Công Doanh, director of MIDU Pharma, had imported fake medicines from foreign countries and distributed it to pharmacies in the capital city. Since there is no official approval for the import and use of homeopathic medicine, the Vidatox products found in the market are typically hand carried by people traveling overseas. Dr Thuấn stressed that patients should consult doctors before taking any medicine or supplement. Cancer treatment is complicated and many different methods and protocols are used, based on the patient’s condition. Moreover, all anti-cancer medicines have toxicity and side-effects, and their misuse can be extremely dangerous, according to Thuấn. Additionally, patients who use unproven medication may miss successful treatment opportunities. So they should strictly follow treatment regimens.